13 September 2016. A technology for fitting and programming a hearing aid online received a U.S. patent earlier this month. The U.S. Patent and Trademark Office issued patent number 9,439,008 on 6 September to Adnan Shennib, founder and CEO of iHear Medical Inc. in San Leandro, California. 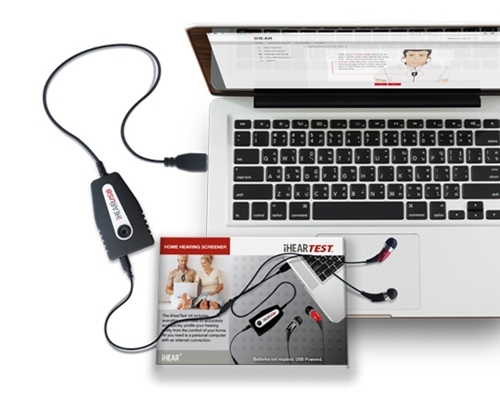 USPTO awarded another patent earlier in the year for the company’s online hearing test technology. Hearing loss is a major cause of disability, with 13 percent of individuals in the U.S. age 12 and over reporting hearing loss in both ears. The rate rises to 25 percent for people age 65 to 74, and 50 percent for individuals age 75 or more. National Institute on Deafness and Other Communication Disorders, or NIDCD, says less than 1 in 3 people age 70 and over (30%) who could benefit from a hearing aid use a device. For adults under 70, the usage rate drops by about half to 16 percent. The technology in the patent makes it possible for hearing aid customers to fit and program their hearing aids from home, rather than going to a clinic, which iHear Medical says helps bring down the high cost of programmable hearing aids. With the iHear platform, says the company, customers can perform hearing tests, as well as device fitting and programming from their homes. The new patent covers the technology for generating and sending streaming audio signals over the Internet to the customer, with the customer interacting with the device and signals to program the hearing aid to meet the individual’s conditions and circumstances. A remote server sends out sound segments, which the hearing aid device receives and customer adjusts based on his or her ability to hear those sounds. The technology includes contingencies where the customer uses a personal computer to receive the signals, or voice over Internet protocol or VOIP connections. Some iHear devices, those designed for mild to moderate hearing loss, are worn inside the ear, and the patent covers methods for fitting the hearing aid. The technology includes personalized configuration of the device to hear both loud and soft volume sounds. While the technology anticipates most customers interacting directly with system, it does allow for customer assistance staff helping out if needed. The patent follows another U.S. patent issued in May 2016 for online hearing tests, which screens for hearing loss. The patent covers the company’s equipment that attaches to a personal computer and software that generates sound signals and evaluates the customer’s responses. The test, cleared by FDA, helps determine an individual’s candidacy for a hearing aid, but is not considered a full-scale clinical diagnostic for hearing disorders. The testing technology patent also credits Adnan Shennib as its inventor. The company says its processes allowing for initial screening and device fitting and programming at home could change the economics of the hearing aid business. The iHear devices cost consumers less than $300, while the company claims programmable devices from conventional hearing aid clinics have an average price of $2,400.